Ready for an intimate reader escape? 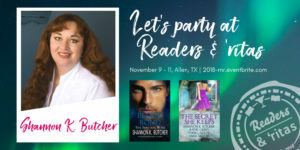 Come to Readers & ‘ritas and hang out with authors such as Christine Feehan, C.L. Wilson, Lori Foster, and me! Rub elbows with your favorite authors and meet new ones. We’ll be having panels, pajama parties, meals with authors, a screening, and much more. Don’t miss out, space is limited! Join me November 9-11 at the Hilton Garden Inn in Allen, TX.